On May 11, 2017, the Pacific Union College Board of Trustees announced Dr. Robert A. Cushman Jr. has been selected as the new president of Pacific Union College. Cushman currently serves as the vice president for academic administration for Walla Walla University in Walla Walla, Wash., and has spent the last 26 years in Adventist education serving in various capacities. 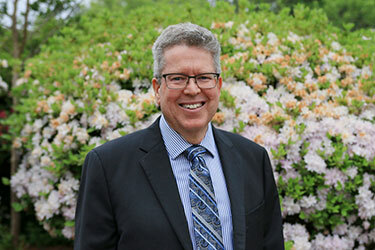 He will begin his role as president July 1, in preparation for the new academic year, and will be the college’s twenty-third president in its 135-year history. Cushman received his Ph.D. in geology from the Colorado School of Mines, his master’s degree in geology at Loma Linda University, and his bachelor’s degree in biology at Walla Walla College (now University). After spending five years as a geologist and paleontologist, Cushman felt God’s calling to educate young minds. In the 12 years he taught at Loma Linda University, he served as assistant professor, associate department chair, and the department chair of the department of earth and biological sciences, where he taught graduate level courses, conducted research in Western Colorado and Wyoming, and advised graduate student research. Additionally, under his administrative duties, he oversaw the department’s budget and coordinated the undergraduate geology program. Cushman then took on the role of vice principal while teaching grades 7-12 and coaching men’s varsity basketball at El Dorado Adventist School for two years before accepting a position as professor of paleobiology at Walla Walla University in the department of biological sciences. He served in this capacity as well as department chair for four years before accepting the position of vice president for academic administration at the school. During his four and a half years as vice president, Dr. Cushman provided administrative and academic leadership while coordinating all formal instructional services of the university. Cushman is a passionate Adventist educator who looks forward to helping PUC as the college continues to develop its new strategic plan. His commitment to collaborative efforts and willingness to partner with faculty, staff, and students, makes him a great addition to the college’s administration team. Cushman, along with his wife Judy, a school psychologist, look forward to their move to Angwin and joining the college community.